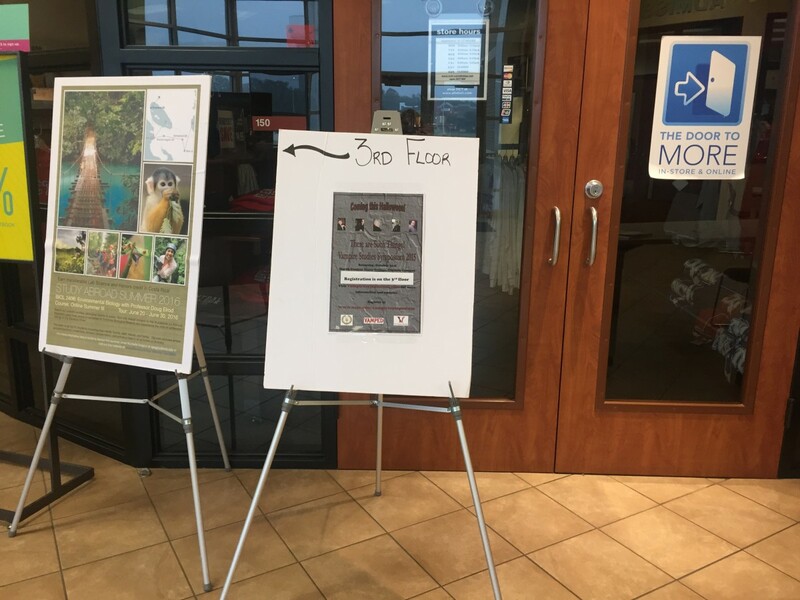 On Oct. 31, 2015 I attended There Are Such Things! 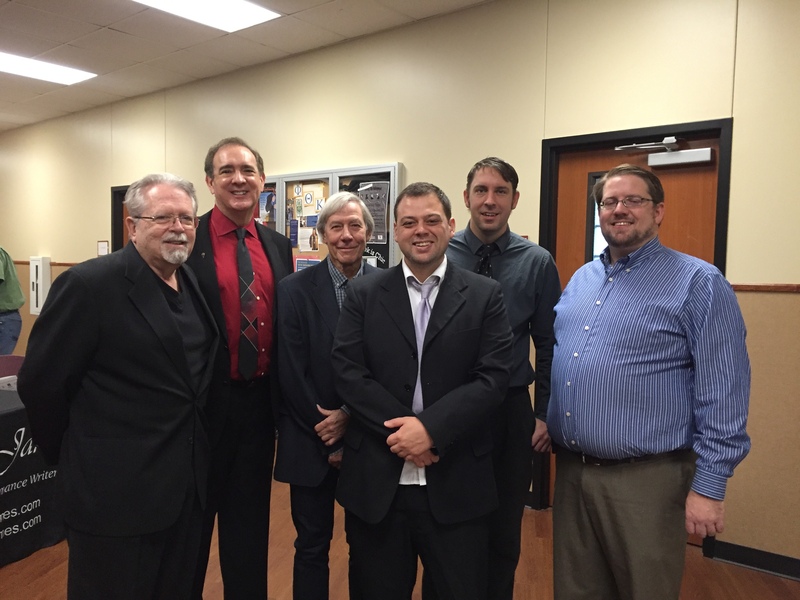 Vampire Studies Symposium at North Central Texas College in Corinth, Tex. with my other half, and my Vamped colleague, Anthony Hogg. Vamped supported the event by creating a website. 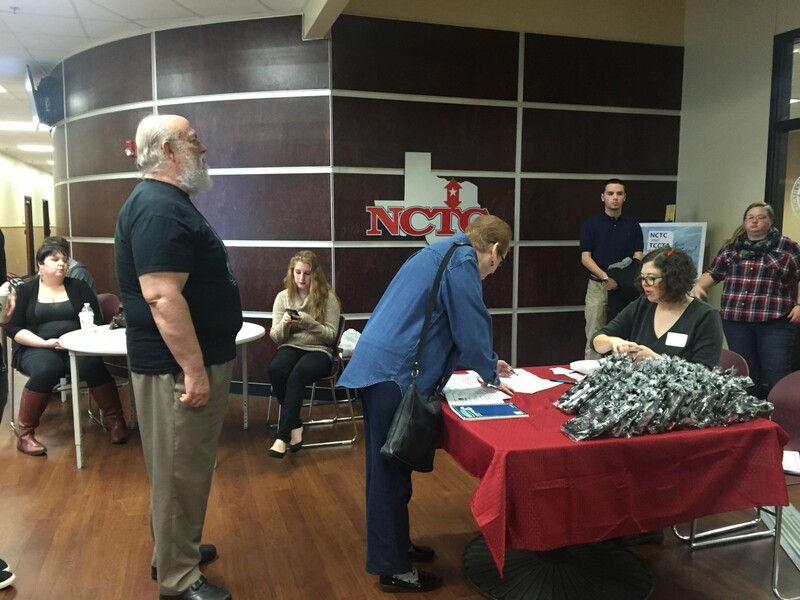 We also provided some vampire themed loot bags, obtained some prizes and helped with the organization of the event. Despite knowing the event’s agenda in advance, I was not sure what to expect from a content perspective for the presentations. Being a newbie to the field of vampirology, I have discovered some academic readings are challenging and dry; some books take a little effort to get into. I was secretly hoping the symposium would not follow the same pattern. We arrived at 8:30 a.m. and things were just getting set up by the staff at the school. We managed to mingle with the guest speakers before heading into he presentation room to set up our video equipment and secure some front row seats. Before starting, Dax Stokes, lead organizer for the event, did an introduction welcoming everyone and pointed out I’d flown in from Canada and Anthony from Australia otherwise it seemed like everyone else was from Texas. Anthony instructed me to take notes because this was essentially a crash course for me in vampirology and being a veteran in the field with over ten years experience, it was essentially a review for him. Melton supplied a mini history lesson on vampire studies incorporating John William Polidori, Lord Byron and Mary Shelly, which was a good lead in. He also dropped other names like: Martin V. Riccardo, Raymond T. MacNally, Radu Florescu, Massimo Introvigne, Elizabeth Miller and Robert Eighteen-Bisang. The names were significant to me because after the hundreds of conversations Anthony and I have had, finally I was recognizing names. Pieces of the grand puzzle were finally falling into place. 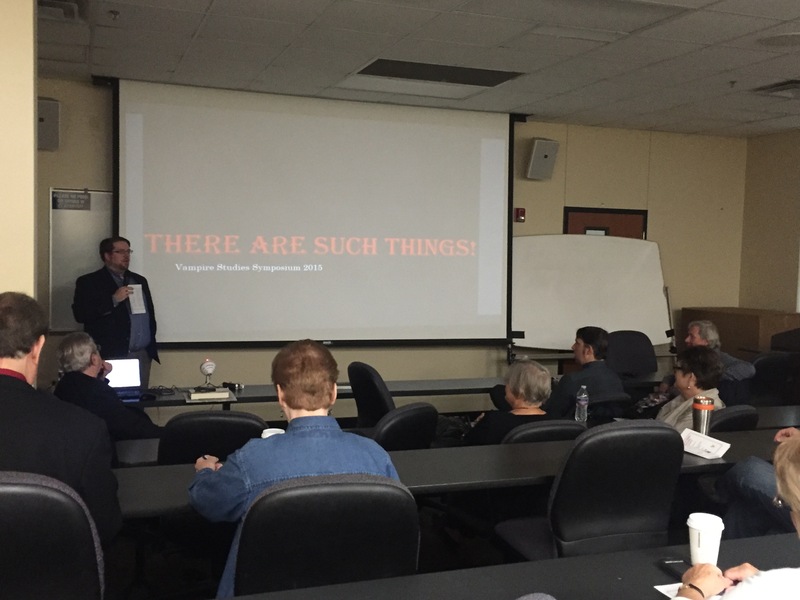 I enjoyed how Gordon’s presentation was like a mini history lesson that incorporated his life events such as his encyclopedia being released at the same time as the Interview with the Vampire movie in 1994, because it tied into my life. This was when I picked up Rice’s books in high school, which is when my love of vampires evolved from just horror books and movies. Him touching on pop culture hits like: Buffy the Vampire Slayer, Blade, True Blood, and Twilight had meaning for me. Garza’s presentation required more detailed note taking. He discussed Samuel Taylor Coleridge’s poem Christabel; Carmilla, that first appeared in The Dark Blue; Bram Stoker’s Dracula; the film Nosferatu (1922) and Elizabeth Bathory. From here, we ventured into new territory for me as he discussed; Nikolai Karamzin, Vasily Zhukovsky, Alexander S. Pushkin, Aleksej K. Tolstoy, Mikhail A. Bulgakov, Viktor Pelevin, and Sergey Lukyanenko. To be honest, I had no idea who these people were, let alone how they contributed to the genre. I also took lots of photos of the slides so I would be able to reference the names later. What really made an impression on me was Thomas’ passion; his level of engagement and high energy kept me interested the entire time. I would love to sit in one of his classes sometime, it would be a great experience. He also showed a few film clips, including one from Viy (1967), directed by Georgi Kropachyov and Konstantin Yershov. The scene in the church with the priest and monsters sucked me in and left me wanting more. I am definitely adding this film to my Virgin’s View list. There was a short break for lunch. I picked up a signed copy of Melton’s The Vampire in Folklore, History, Literature, Film and Television from Melton’s book stall. My boyfriend picked me up a couple of signed books for a Christmas present, but I can’t remember which ones. 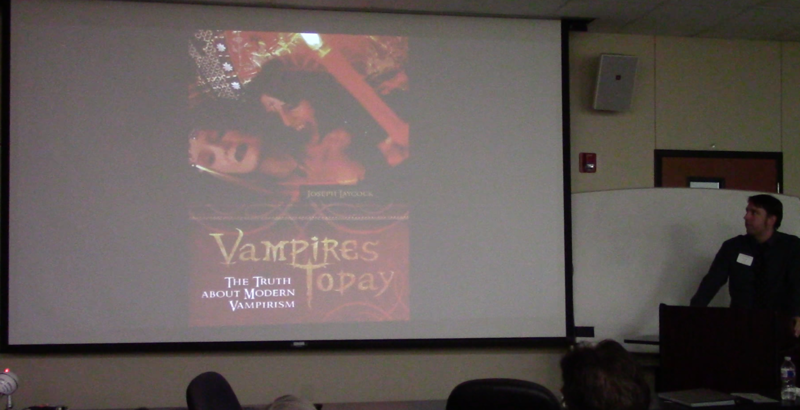 I brought along to copies of my books for the authors/speakers to sign: Joseph Laycock’s Vampires Today: The Truth about Modern Vampirism (2009) and Michael Bell’s Food for the Dead: On the Trail of New England’s Vampires (2011). a Ph.D. in Folklore from Indiana University, Bloomington; his dissertation topic was African American voodoo beliefs and practices. He has an M.A. in Folklore and Mythology from the University of California at Los Angeles, and a B.A., with M.A. level course work completed, in Anthropology/Archaeology from the University of Arizona, Tucson. Michael explained how many people back in the nineteenth century died of consumption or tuberculosis. But since locals lacked the medical knowledge we have now, to deal with the situation they would unearth the corpses and burn their hearts and livers so it could be ingested by surviving relatives. Other methods used were burning a vine, turning a body upside down, removing the shroud, or driving a stake through the heart. Two things I remembered Michael said were: “Raymond McNally called Rhode Island the Transylvania of the US,” and “folklore has a plan B, C, and D.” I remembered McNally’s name from Anthony’s Vlad article, I was happy to make the connection because again it meant I was learning. I enjoyed Michael’s presentation for a few reasons: it touches closer to home having the geographical areas discussed on this continent as opposed to over in Europe and I am a fan of cemeteries. Also his talk related to the first vampire book Anthony suggested I buy, Paul Barber’s Vampires, Burial and Death, which delves into the forensic aspect of vampire folklore. When I was growing up I wanted to be a forensic anthropologist so this stuff interests me. In preparation, I actually started reading Laycock’s book Vampires Today, the week before so I was familiar with some of the ground he was covering. Also a lot of it related to our daily interactions in some of our vampire Facebook groups online. Laycock defined the basics such as: lifestyle vampires, real vampires, psychic vampires, and symptoms when they don’t feed and other medial conditions that are common like anemia, asthma, and migraines. He touched on Michelle Bellanger’s involvement in the community and explained how Patrick Rodgers, a self identified vampire, was thrust into the media spotlight in 2011 when he experienced issues with financial conglamorate Wells Fargo. He also covered the Atlanta Vampire Alliance’s Vampirism and Energy Work Research Study, vampire feeding techniques involving lancets and the importance of mouthwash etiquette. 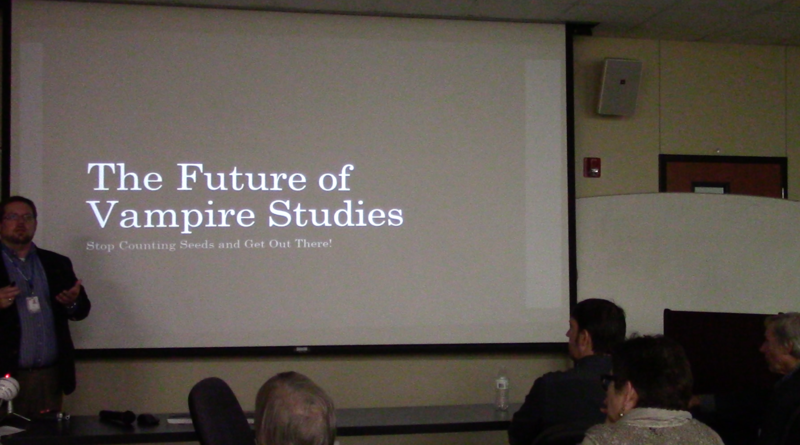 Dax Stokes, librarian at North Central Texas College, was the final speaker with “The Future of Vampire Studies: Stop Counting Seeds and Get Out There.” Dax is also the webmaster for The Vampire Historian site. Dax dropped a lot of names like Leo Allatius, Giuseppe Davanzati, Dom Augustin, Calmet, Montague Summers, Radu Fluorescu and Raymond McNally, Paul Barber, Jan Perkowski, Elizabeth Miller and Gordon Melton. The latter half I am familiar with, but the first three not so much. He discussed the study of vampirology, the study of vampires or vampire mythology and explained it can be anyone that studies anything to do with vampires. Fields he feels should be looked at include: folklore, mythology, history, Dracula studies, literature, film, pop culture, psychology, sociology, and medicine. 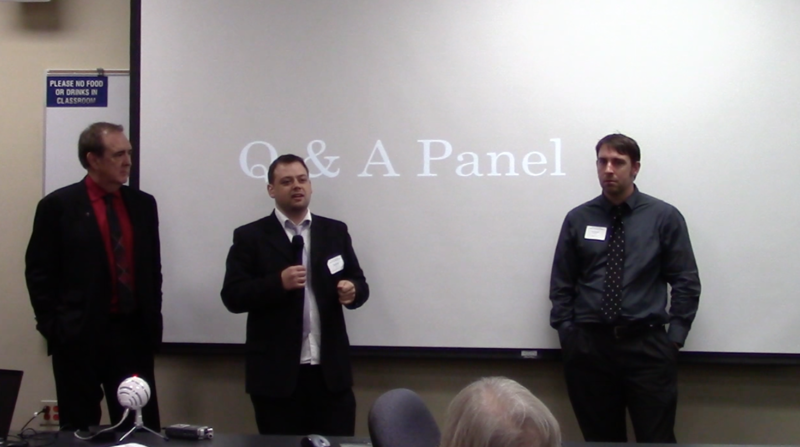 The symposium wrapped up with a Q & A panel where Anthony was invited to partake. My background on vampirology, I prefer to refer to myself as a vampirologist. I am actually one of the few people in the world that do that. There is a tiny handful and I am surprised to see Joseph [Laycock] refer to himself as one. That to me gives an idea of the diversity of the study as Dax covered there. My personal take on it is from a historical slash skeptical slash detective kind of perspective. What I like to look at is historical sources. I’ve had this conversation with Michael [Bell]. I tend to have a genealogical view of it, like show me the specific use of the word, cause I tend to place it safe in terms of how I use it. But what fascinates me about these conversations is I actually like the classic information because that is what helps define knowledge. Knowledge is born from a baptism of fire. You can’t refine any kind of field, without having it contradicted in some way otherwise you’re just validating your own position. That’s not how you develop knowledge at all. So my take on it, is very conflicted but I fight hard against in my online dealings mainly, but I see it as a necessary process because when I engage in that sense I learn more about myself. And I’ll tell you this, the thing that gives away the most uh, I think the interest that someone has in vampires is reflected on when they were first exposed to it and it carries through into their field of study. 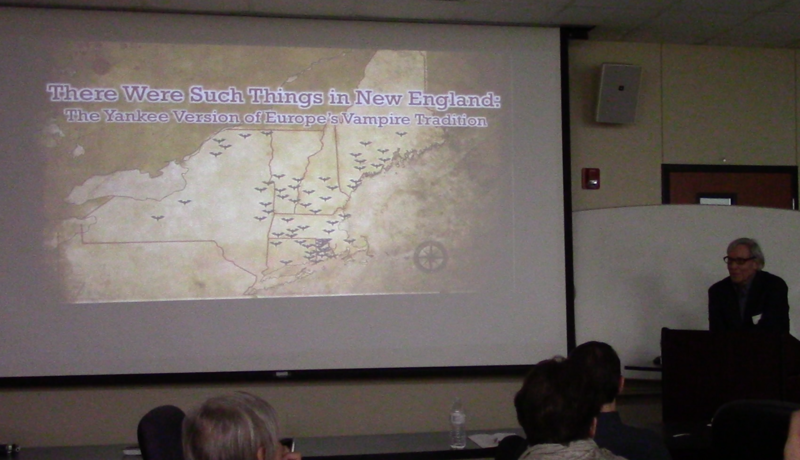 Anthony’s participation was a big deal because essentially it was the first time he spoke in public about vampirology. The other speakers explained their views as well and answered some questions from the audience before officially ending the event. What did I take away from the symposium? I made some networking connections with key people in the field. I discovered that vampirology does not have to be dry and complex as some academic writings I have seen. The speakers gave life and passion to their own niche in the field; educating while being entertaining at the same time. Their presentations gave me an exciting glimpse into what their books, that I have not read yet, hold. I like to think of Anthony not only as my friend and colleague, but as a mentor too. Over the last two years, he has guided and assisted me with building my own vampire library, fit for any aspiring vampirologist. He has also spent time educating me, which sparked my interest in vampire folklore. I try to pay attention, but honestly sometimes all the information gets a little overwhelming and intimidating. This symposium proved to me that despite having a marketing and sales background, all it takes to be part of this field is a desire to learn. creating a website: http://vampiresymposium.com/. archive.is link: https://archive.is/8YPtm. 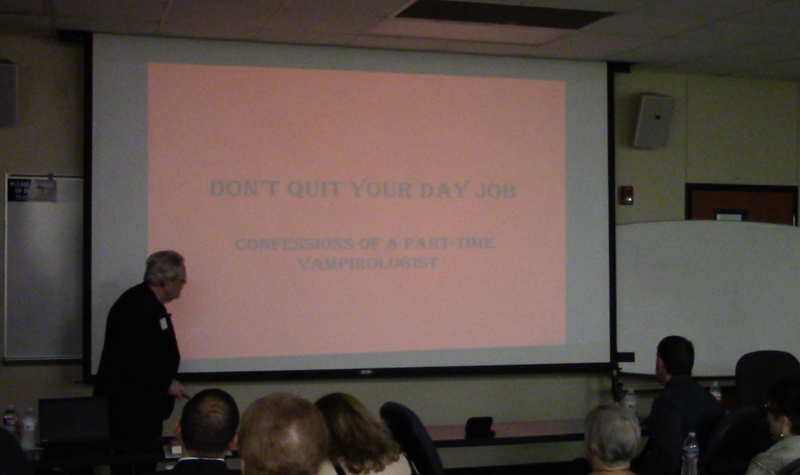 event’s agenda: “Schedule,” Vampire Symposium 2015, 2015, accessed Nov. 28, 2015, http://vampiresymposium.com/vampire-symposium-schedule/. archive.is link: https://archive.is/7Droj. a book he was kind enough to send me: Erin Chapman, “Gift from Thomas J. Garza: Vampire Book Arrives in the Mail,” Vamped, Nov. 24, 2015, accessed Nov. 28, 2015, http://vamped.org/2015/11/24/gift-from-thomas-j-garza-vampire-book-arrives-in-the-mail/. Michael has an impressive educational background: “Speakers,” Vampire Symposium 2015, 2015, accessed Dec. 4, 2015, http://vampiresymposium.com/speakers/. archive.is link: https://archive.is/SqI5T. interest in cemeteries: As attested by my website, Graveyard Girl: http://graveyardgirl.ca/. archive.is link: https://archive.is/FjkOR. Anthony’s Vlad article: Anthony Hogg, “Was Vlad Dracula a Vampire?” Vamped, Jan. 27, 2015, accessed Nov. 28, 2015, http://vamped.org/2015/01/27/vlad-dracula-vampire/. thrust into the media spotlight in 2011: Joseph Laycock, “The Vampire Who Beat Wells Fargo,” Religion Dispatches, March 21, 2011, accessed Dec. 4, 2015, http://religiondispatches.org/the-vampire-who-beat-wells-fargo/. archive.is link: https://archive.is/DXWJO. The Vampire Historian: http://thevampirehistorian.com. archive.is link: https://archive.is/cZefp. 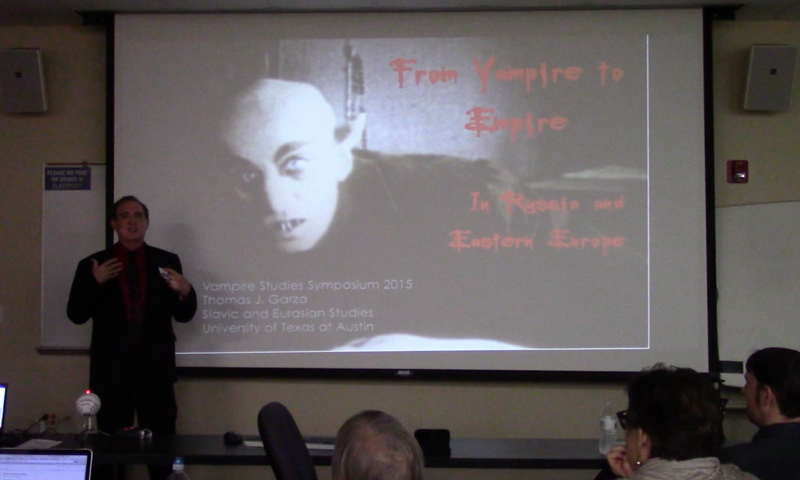 Dax Stokes, “Vampire Studies Symposium to Be Held in Texas on Halloween,” Vamped, June 10, 2015, http://vamped.org/2015/06/10/vampire-studies-symposium-to-be-held-in-texas-on-halloween/.